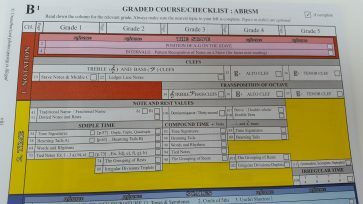 Differences (as well as similarities) between ABRSM and Trinity College London Music theory syllabuses can be seen on the graded checklists which are displayed at the beginning of the All-In-One music theory books. There are some similarities as well as differences between ABRSM and Trinity College London theory exams. ‘All-In-One music theory’ books (THIRD ed), unlike most others, are suitable for BOTH Associated Board (ABRSM) and Trinity College London students. One reason for this is that students can easily navigate their way through the grades for either examination board by referring to the Graded checklists at the front of the book (and tick off the topics when they have been completed). ABRSM students require only one book (All-In-One to Grade 5/All-In-One: Grades 1-3 or All-In-One: Grades 4-5) however Trinity College London students using All-In-One to Grade 5 also require the ‘Trinity Supplement’ booklet (£3.99) to use alongside. You are advised to see the graded checklists within the book itself to understand in detail the similarities and differences (students using All-In-one: Grades 1-3 and Grades 4-5 book do NOT require the additional Trinity Supplement booklet because these books already contain this material in the Appendix). ABRSM is the most popular examination board yet Trinity College London exams are equally recognised qualifications. Trinity is perhaps most suitable for instrumentalists learning pop music or jazz due to its inclusion of jazz chord symbols (as well as Roman notation). It focuses upon composition (at an earlier stage) via adding a bass line to a melody or vice-versa. Trinity students, unlike ABRSM students, are expected to know about ostinato (common in jazz music) , syncopation, sequences (real and tonal) the ‘natural minor’ and pentatonic scale, inverted intervals, arpeggios, broken chords and a little about the guitar and saxophone. Topics contained in the Supplement booklet are closely related to topics already studied in the main book (e.g. ‘broken chords’ can easily be understood by anyone with knowledge of the tonic chord and inversions). Therefore anyone, not just Trinity students, will find the ‘Trinity Supplement’ highly beneficial and the next logical step. Compound time signatures are introduced at grade 3 for both ABRSM and Trinity students. However, ABRSM students are expected to know a wider variety of key signatures at an earlier stage than Trinity students. Unsure which exam syllabus to follow? Why not start with All-In-One to Grade 5 book/All-In-One: Grades 1-3 or All-In-One: Grades 4-5 and decide when you are ready, in your own time. 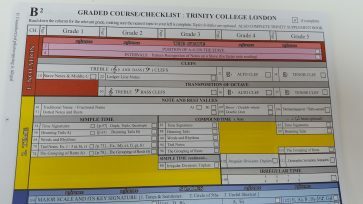 If you wish to learn the few extra subjects required by Trinity College London syllabus, progress to the Trinity Supplement booklet (or simply turn to the ‘Appendix’ at the back of the All-In-One: Grades 1-3 and 4-5 books). Which exam syllabus do you prefer and why; Associated Board or Trinity College London? Did you also know that All-In-One Music Theory will soon also feature a ‘Victoria College of Music Graded Checklist (VCM)’? There are many advantages about taking VCM exams. Want to read more? Go to https://www.vcmexams.co.uk/ Also please click here to read our blog and stay tuned for updates.